That didn't take long. Runner-up in the Shot Put Indoors, Anthony Harrison (Ramapo) has been awaiting the fresh air of Spring Track. There, he could return to Discus, an event he won at the USATF Junior Olympic Champs last Spring with a 169-9 personal best. And return he did. Not only has Harrison added 9-feet to his Shot PR since the start of Indoor, it would seem his Disc has taken a similar jump. 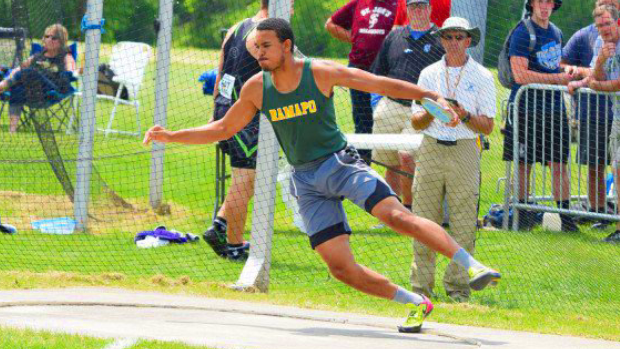 Unofficially, he opened his season on Thursday, throwing a personal best of 173-10 in a local dual meet. Two days later, now at the Pearl River Pirate Relays, Harrison let loose, throwing the implement out to a career best 190-5. Harrison was not the top returner this year. Reigning State Champ Steven Vasile (Commack) has yet to open his season, but left 2018 with a best of 177-7 at States. Harrison placed 4th in the Fed Final. We could be looking at a great duel in the circle. The mark is US #5 in this early portion of the season. Closer to home, it ranks as #9 All-Time, as well as a new Section 1 Record. In the last 15 years, only two New York athletes had broken the 190-foot barrier, and neither of them did so as early as the first weekend in April. The last to do so was Sam Wray (Starpoint), who would win the State Title his senior year, and leave with a personal best of 194-4. Only one athlete in State History has broken 200-ft, let alone 196-0. That's Andy Bloom (Niskayuna), who threw the standing State Record of 202-9 way back in 1991. Could we see that go down this year? It's a long season ahead.